The S allele of the functional 5-HTTLPR polymorphism has previously been associated with reductions in memory function. Given the change in function of the serotonergic system in older adults, and the functional consequences of memory decline in this age group, further investigation into the impact of 5-HTTLPR in healthy older adults is required. This investigation examined the effect of 5-HTTLPR variants (S carriers versus L/L homozygotes) on verbal and visual episodic memory in 438 healthy older adults participating in the Tasmanian Healthy Brain Project (age range 50� years, M = 60.35, s.d. = 6.75). Direct effects of 5-HTTLPR on memory processes, in addition to indirect effects through interaction with age and gender, were assessed. Although no direct effects of 5-HTTLPR on memory processes were identified, our results indicated that gender significantly moderated the impact that 5-HTTLPR variants exerted on the relationship between age and verbal episodic memory function as assessed by the Rey Auditory Verbal Learning Test. No significant direct or indirect effects were identified in relation to visual memory performance. 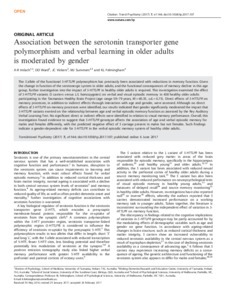 Overall, this investigation found evidence to suggest that 5-HTTLPR genotype affects the association of age and verbal episodic memory for males and females differently, with the predicted negative effect of S carriage present in males but not females. Such findings indicate a gender-dependent role for 5-HTTLPR in the verbal episodic memory system of healthy older adults.